Last night we had the chance to attend the media launch of the reimagined Hazendal. What a spectacular event. But more than that, we couldn’t help but be touched by the passion and energy of the delightful Voloshin family. This is a must-visit destination in the Stellenbosch region. Avant-Garde: Off-centre, forward-looking, unconventional state of mind with respect for art, culture and society. 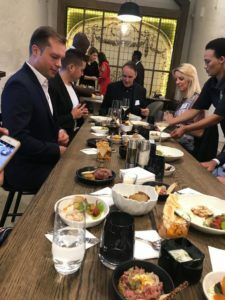 Avant-Garde pushes boundaries through its contemporary and creative interpretation of South African and Russian recipes and the fusion of these two cultures. With a focus on the quality of the ingredients, each creation is framed by Hazendal’s fine wines, in addition to labels from neighbouring wineries in the Bottelary region. The restaurant’s interior is complemented with a hand-painted mural ceiling, an exotic aquarium, full bar and views of the neighbouring wine cellar’s impressive stainless-steel tanks behind glass panels. The restaurant’s menu is inspired by South African and Russian traditional recipes with a globally inspired contemporary interpretation. Each dish focuses on seasonality, with fresh ingredients being prepared to create a feast for the senses. The menu changes frequently according to the availability of products and produce from local farmers. The use of food and wine to share a story is evident in the restaurant’s menu. From 16:00-19:00, Avant-Garde offers a Zakuski (Russian-inspired tapas-style food) menu, that is perfect for a leisurely after-work dinner with the sunset setting behind the Bottelary Hills. The Zakuski menu is also ideal for families with young children who wish to enjoy an early dinner. • Avant-Garde: Open Tuesday to Sunday from 11:30 to 15:30. • Zakuski: Open Tuesday to Saturday from 16:00 to 19:00. With South African-born executive chef Michélle Theron’s international expertise in fine dining to inspire Hazendal’s menus, guests can expect a tasteful welcoming and leisurely culinary experience that varies in style. Each of Hazendal’s dining establishments offer a distinct ambience and is the ideal canvas for a creative play on food creations, which stem from local and global inspiration. Every venue offers a taste of Russia which is reflected on the menus. Hazendal’s culinary portfolio caters to a broad range of taste preferences and occasions: from fine dining, deli-style eating, shared plates and picnics to private functions and kids’ offerings. Nestled on the slopes of the Bottelary Hills midway between Cape Town and Stellenbosch, Hazendal is a popular stopover for travelers and those who reside nearby. Located adjacent to Bottelary Road/M23, Hazendal is just over 25 minutes’ drive from the Cape Town International Airport, 20 minutes from Stellenbosch and approximately 30 minutes from Cape Town’s CBD. 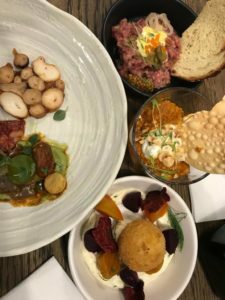 The Babushka Deli fuses South Africans’ adoration for flavoursome home cooking with some Russian food fare and nourishing treats for which babushkas (Russian grandmothers) have traditionally always been celebrated. 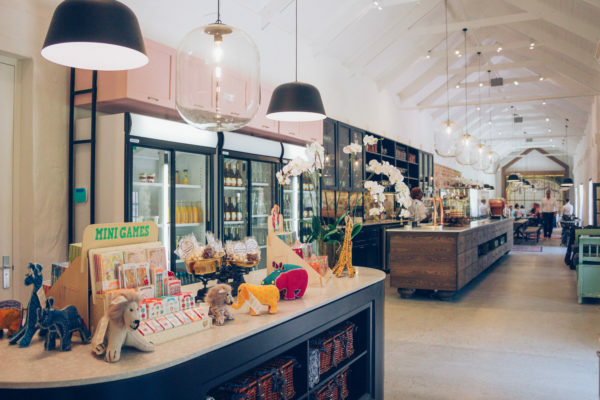 Using locally produced ingredients from suppliers who take organic and sustainable farming principles to heart, the Deli makes an unplanned or planned visit to Hazendal one that satisfies an appetite for authentic, freshly baked goods, take-home products. Chef Michélle Theron’s food combinations can be paired with the estate’s wines and local craft drinks. 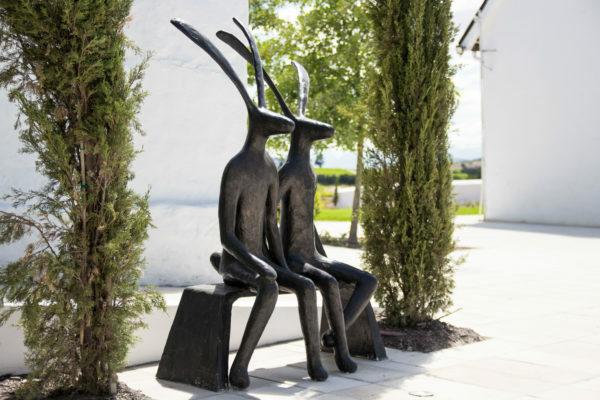 Guests can opt for an alfresco meal on the Deli’s terrace (Hazendal’s historic Threshing Circle) in the company of a large-scale stone sculptures of two donkeys by South African artist Angus Taylor, and magnificent views of Hazendal’s werf. Guests can also enjoy a Dacha Picnic basket on Hazendal’s sprawling lawns, consisting of a range of culinary treats made from the freshest ingredients. As with all Hazendal’s offerings, special attention is given to Hazendal’s little guests who can enjoy a picnic basket filled with delicious food and a DIY cookie decorating kit. • Meal offerings: All-day breakfast, light meals, bistro style-food, Russian-inspired culinary delights and a children’s menu. • Open: Tuesday to Sunday from 08:00 to 17:00. • Pre-booking for picnics a day before is essential. A deposit is required. High tea will never be the same after experiencing Hazendal’s Russian Tea Ceremony in Hazendal’s Russian Tea Garden. 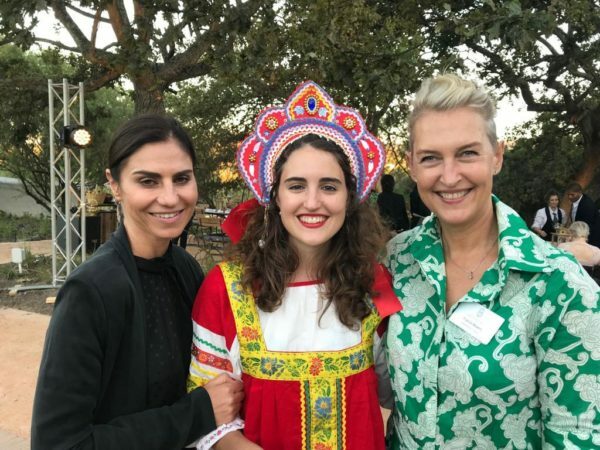 Spanning generations, Russian tea-drinking has become an integral part of the country’s culture, highlighting the principles of friendship and warm hospitality. During Hazendal’s Russian Tea Ceremony, a specially sourced and imported black Russian tea blend is served from a steaming Samovar (ornate Russian tea urn) and presented in traditional hand-painted porcelain tea sets from the Dulevo porcelain factory, one of the oldest and most famous porcelain producers in Russia. The tea ritual is a visually intriguing experience that breathes new life into age-old tea brewing customs. Little guests can enjoy a specially designed tea menu and show off their artistic talents with Russian-themed colouring-in pages. 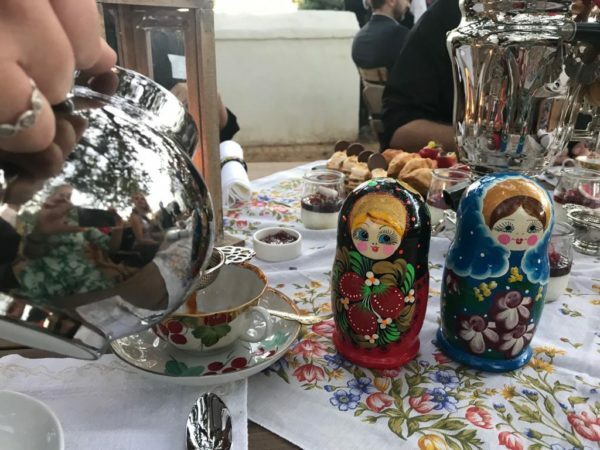 With each table donning a distinct table setting, and the garden’s relaxed atmosphere, Hazendal’s Russian Tea Ceremony is a culturally rich and exquisite experience for young and old. Walk-in guests who have not pre-booked for the Russian Tea Ceremony, can enjoy the Garden Menu in the beautiful and tranquil garden. Hazendal, one of Stellenbosch’s oldest wine producing farms, has turned a new page in its tale as a leading Winelands destination. Winemaker Clarise Sciocatti-Langeveldt and her team will further establish Hazendal as a producer of premium, award-wining wines. The wines produced include the easy drinking and whimsical Christoffel Hazenwinkelseries, consisting of white and red blends, as well as a blanc de noir. The premium Hazendal range has been raking in awards. Hazendal’s wines can be tasted in the newly designed Wine Tasting Lounge where wine lovers can embark on a sensory journey by joining us for wine or a food and wine pairing. Private tastings are also on offer in the Lounge’s private tasting room. 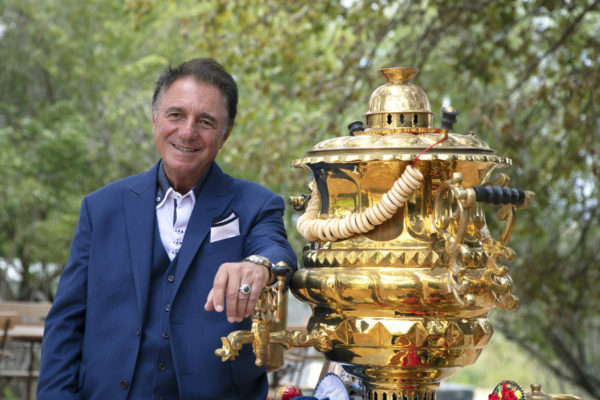 Look out for our elegant hare, Christoffel Hazenwinkel, who is the proud namesake of Hazendal’s first owner. An exciting imminent addition to Hazendal’s premium offeringsis the new vodka range. It isthe result of the team’s creative and forward-thinking approach to blending South African and Russian traditions. Vodka tastings will take place in the Vodka Bar, which is designed as an authentic traditional Russian vodka bar, boasting opulent décor and a fireplace. • Open: Tuesday to Sunday from 09:00 to 17:00. • Bookings for private tastings, pairings and cellar tours are essential. Hazendal’s Family MTB Park and Trail offer the ideal outdoor excursion for the family. Whether you are an amateur or an experienced rider, the Park includes a variety of skills tracks to explore and hone biking skills. The selection of trails includes pump tracks, flow trails (trails which resemble hiking trails and encompass chunky to flat, and tight turns), a skills trail for beginners, kiddies skills trail (eight years and younger) and Y-bike trail (otherwise known as a balance or walking bike for toddlers). 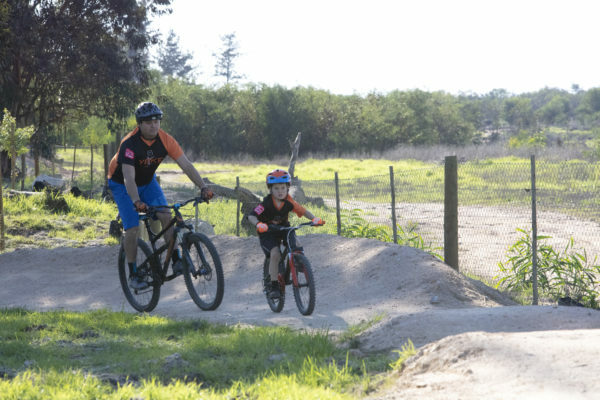 Riders can also ride on one of the two single, family-friendly MTB trails (including 3km and 5km trails) and enjoy panoramic views of the Stellenbosch region’s outdoor setting. On completing their chosen route, riders can catch their breath at Hazendal’s public picnic area. The outdoor section offers several picnic tables as well as a kids’ play area that are great for social gatherings and kids bike parties. • Daily permits for the Hazendal’s Family MTB Park and Trail can be purchased at R50 per person at the Park’s Ticket & Treats hut. Annual permits are also available. • Coffee, soft drinks and refreshments can be purchased on site. • Open: Tuesday to Sunday from 08:00 to 17:00. 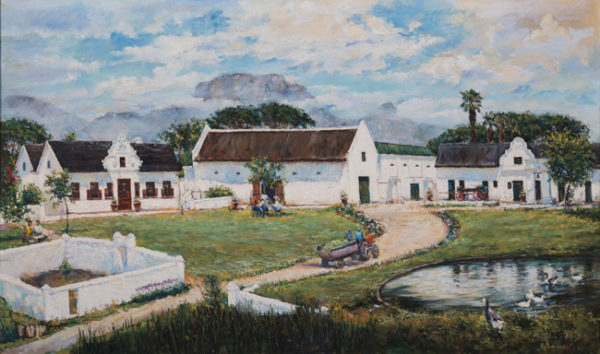 For more than three centuries, Hazendal has been a widely recognised Cape Winelands landmark and has transitioned from its humble origins as a grain and livestock farm in the 17th century, into a notable premium wine producer and estate. After closing in 2017 for major renovations, Hazendal has opened its doors again in December 2018 to reveal a destination offering which is completely unique and distinctive. What was initially planned as merely a revamp of Hazendal’s tasting rooms soon evolved into a full-blown re-imagination of the Hazendal Experience. 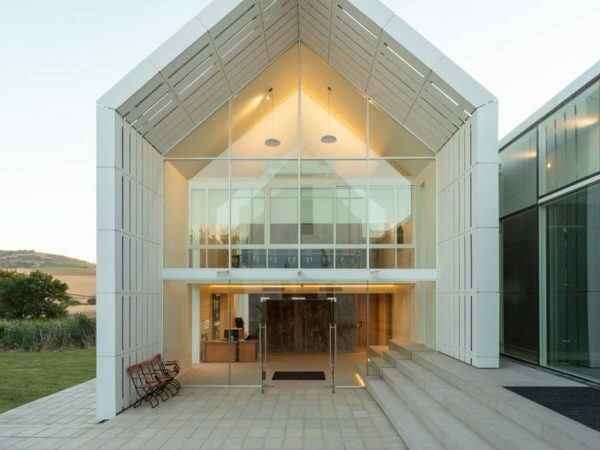 The result is unlike anything experienced on a South African wine estate before, and the re-envisioned Hazendal is set to become a sought-after destination for locals and tourists alike. Situated on the slopes of the Bottelary Hills bordering Stellenbosch, Hazendal is steeped in history dating back to 1699. The land from which the farm flourished was acquired by German settler, Christoffel Hazenwinkel, from the then governor, Willem Adriaan van der Stel. With its population of hares at the time, combined with its founder’s title, the name, Hazendal (Valley of the Hares in Dutch) was a natural fit. Hazendal has seen various transformations since its early beginnings to eventually develop into a premium wine producing estate and a multi-faceted destination. Today, Hazendal flourishes as a family-run enterprise and an inviting place where people can explore a range of enriching experiences that vary in style to suit the guest’s occasion and expectations.